Original Broadway Cast, 1987 (Decca, 2CDs) (2 / 5) There are a few reasons to consider this recording as an alternative or addendum to the one reviewed above. Randy Graff is a wonderful Fantine; Terrence Mann, as Javert, has better vocal technique than Roger Allam; and Michael Maguire is a stalwart Enjolras. There is also some new music on this recording, notably, Jean Valjean’s “Bring Him Home” — a gorgeous song, even if its main melody sounds like that of the “Humming Chorus” from Puccini’s Madama Butterfly, a debt that Claude-Michel Schönberg has reportedly acknowledged. Otherwise, this two-disc set isn’t a whole lot different from its predecessor. 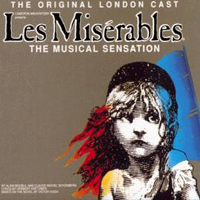 Colm Wilkinson returns as Valjean and, unfortunately, Frances Ruffelle is back as Eponine. — M.P. 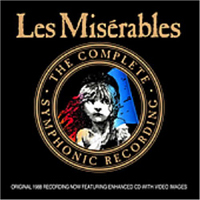 The Complete Symphonic Recording, 1988 (First Night, 3CDs) (1 / 5) The star here is Gary Morris, an American country-western singer who had played Valjean early in the run of the original Broadway production of Les Misérables. Unfortunately, Morris’ accent and mannerisms are just as odd as Colm Wilkinson’s in the role, and his voice isn’t nearly as good. As heard here, Morris has a vibrato so wide that it’s really a wobble; every sustained note he sings is really two notes, and it ain’t pretty. Given that his singing of the show’s central role is unlistenable, the strengths of this recording seem beside the point. Still, for what it’s worth: Philip Quast as Javert and Anthony Warlow as Enjolras are excellent, Michael Ball is back as Marius, and Tracy Shayne sings prettily as Cossette. Also, Debbie Byrne as Fantine delivers the high notes of “I Dreamed a Dream” without belting, and some listeners may therefore prefer her performance to Patti LuPone’s and Randy Graff’s. As Eponine, Kaho Shimada has a better voice than Frances Ruffelle — but, annoyingly, she seems to imitate Ruffelle’s inflections and enunciations. The London Philharmonia orchestra sounds huge and impressive. This is a complete recording of the score, but none of the extra music you’ll find here is worth writing home about. — M.P. 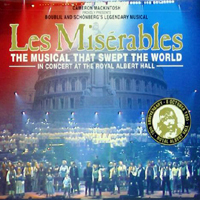 London Concert Cast, 1995 (First Night, 2CDs) (2 / 5) This is a live recording of a concert that was given at the Royal Albert Hall to mark the tenth anniversary of the opening of Les Misérables in London, and there’s quite a sense of occasion about it. In total, some 250 performers took part, and the orchestra is no less than the Royal Philharmonic, conducted by David Charles Abell. 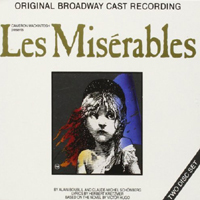 At the end of the second disc, Jean Valjeans from many worldwide companies may be heard delivering various lines of “Do You Hear the People Sing?” in various languages. If you want to choose only one recording of this score for your library, this may be your best option. To begin with, it’s the only one that gives you Colm Wilkinson as Valjean while not subjecting you to Frances Ruffelle as Eponine. Here, Eponine is Lea Salonga, whose lovely, unaffected singing goes a long way toward wiping out memories of Ruffelle’s performance in the part. Other major roles are filled by some of the most talented performers to have played them: Philip Quast as Javert, Ruthie Henshall as Fantine, Michael Ball as Marius, Michael Maguire as Enjolras, and Judy Kuhn as Cossette. Note that a video recording of this concert is also available. — M.P.